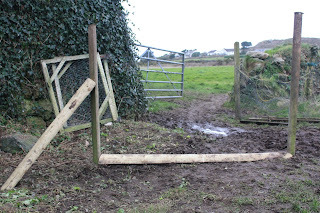 Starting the new chicken fence. One month behind schedule (!!) today we began work on the new chicken fence, the objective being to move our laying hens to a new field, and grow vegetables in the field they vacate (by now rich in chicken manure). Last time we built a chicken fence we knocked the posts in by hand, using a post basher, a job that began in March and finished in May. 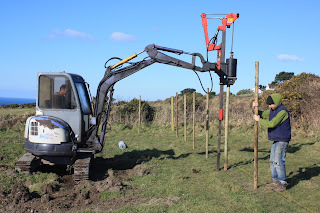 This time we hired a mechanical post basher, and finished the job in half a day. The post basher in action. First side finished by mid morning. 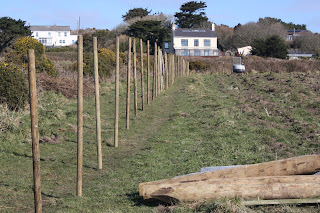 All 170 posts are now in, including large corner posts, and tomorrow we start stapling the wire mesh up. Thanks to David and Max for working on the fence today, and to Tom for agreeing to do the job. 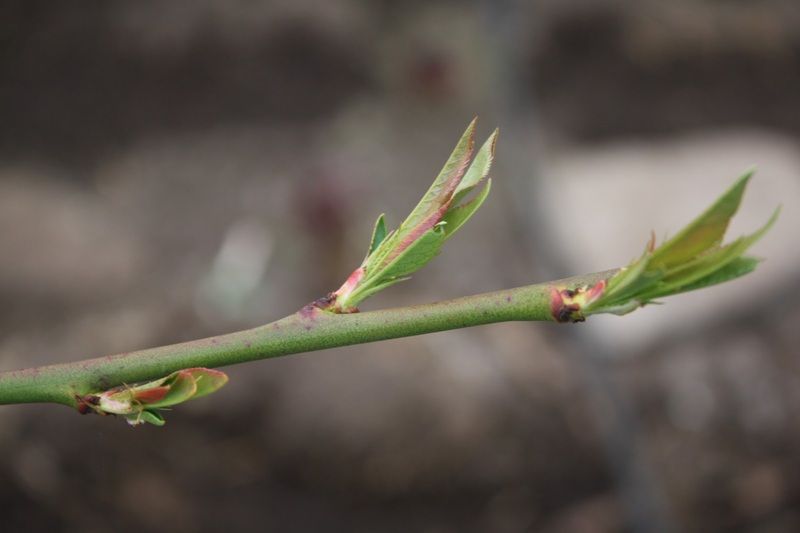 Spring sprang upon us just before the recent cold snap, and our polytunnel production of winter salads instantly increased from 25 to 50 bags a week. It wasn't just the salad that showed signs of new vigour though. 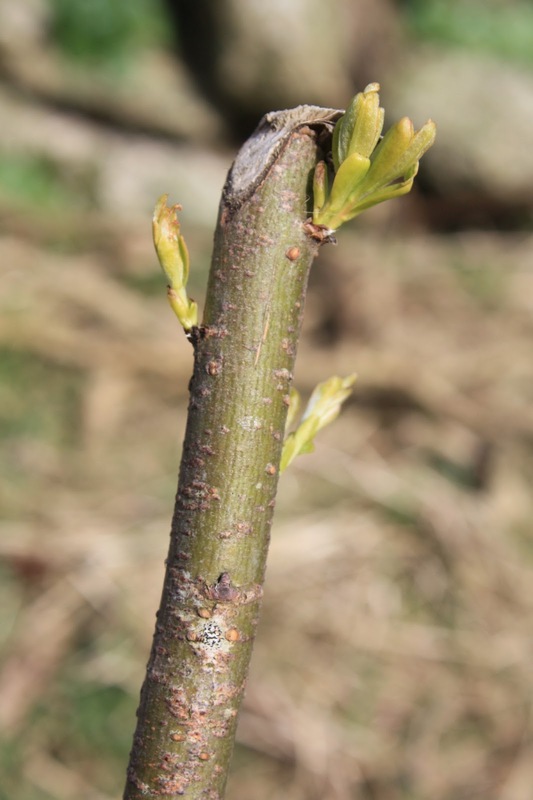 One of our 7 new blackcurrant bushes shooting. Daffodils in bud by the front door. 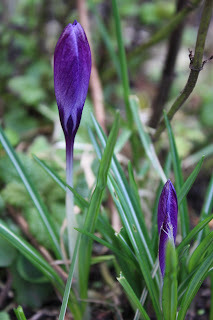 Crocuses appearing in the front garden. Willow whips already shooting after being planted 2 months before. Espalliered peach tree shooting in the polytunnel. Despite freezing temperatures (we had to break the ice on the pig's water bowls twice during the day) yesterday, 6 people came to Greg's tool care (a.k.a. Tool Love) workshop here on the farm. There is an art to caring for your tools, with the objectives being to be able to identify and find the right tool for the job, and for that tool to be in a good enough condition to make the job easier for you. A clean and tidy workshop is key. Laying the tools out to clean them. Greg showed us how to clean the tools, arrange the workshop, sharpen the tools, then store them safely. 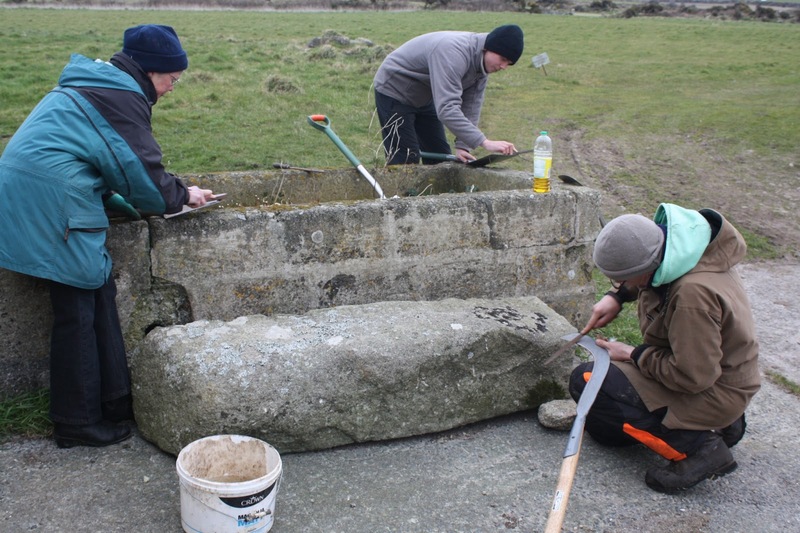 Our new tool procedure on the farm will involve 5 minutes of sharpening each tool before use (a sharp spade will dig much easier than a blunt one, for example), and 5 minutes of cleaning each tool after use, before being put away in the correct place. 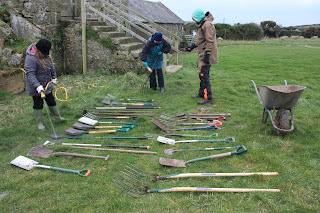 Thanks to Greg Humphries for running this workshop, and to all those who attended despite the numbing wind. 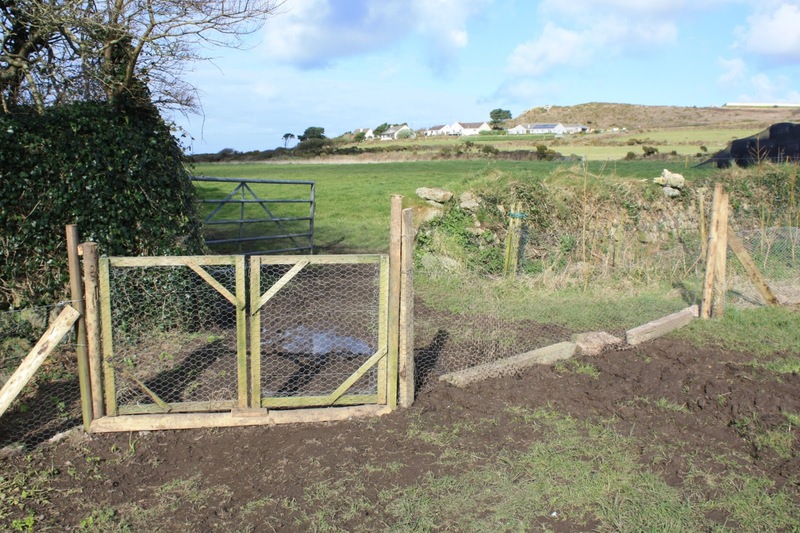 The main pedestrian/wheelbarrow and tractor gateways completed. 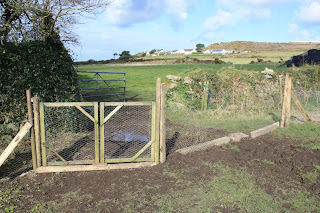 The gateway to the water trough and tap completed. The tensioning wire is now in place, plus an extra wire above it to add visual height, and that's the rabbit fence done! Saturday 10 am till noon - "Tool Care" with Greg Humphries, here on the farm. 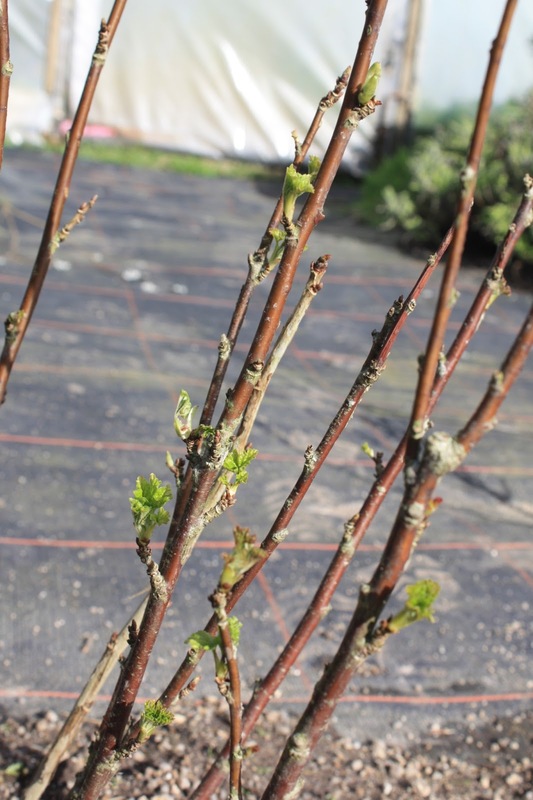 Learn how to care for your gardening tools, particularly useful for current farm volunteers and budding allotment-holders. 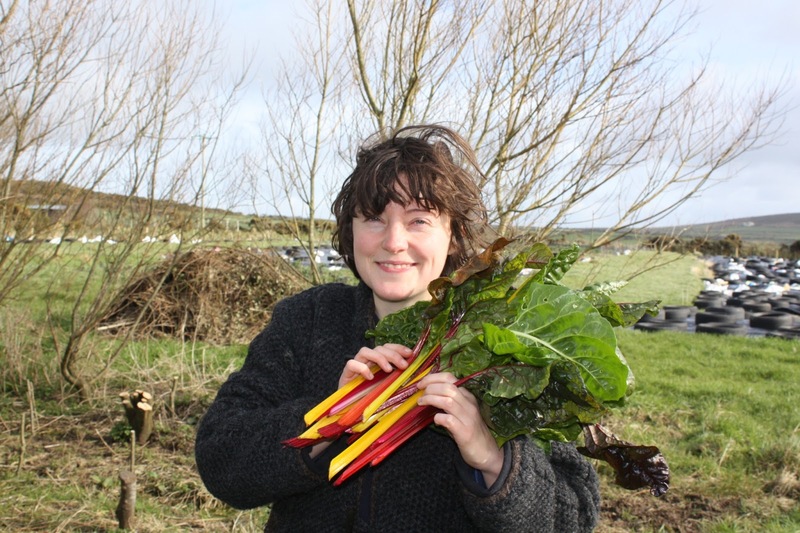 Sunday 10 am till noon - Cookery workshop in the Age Concern Kitchen, St Just, with Lynne Dyer and Sonia Fairfield. Learn how to prepare onion tarts and pickled onions. 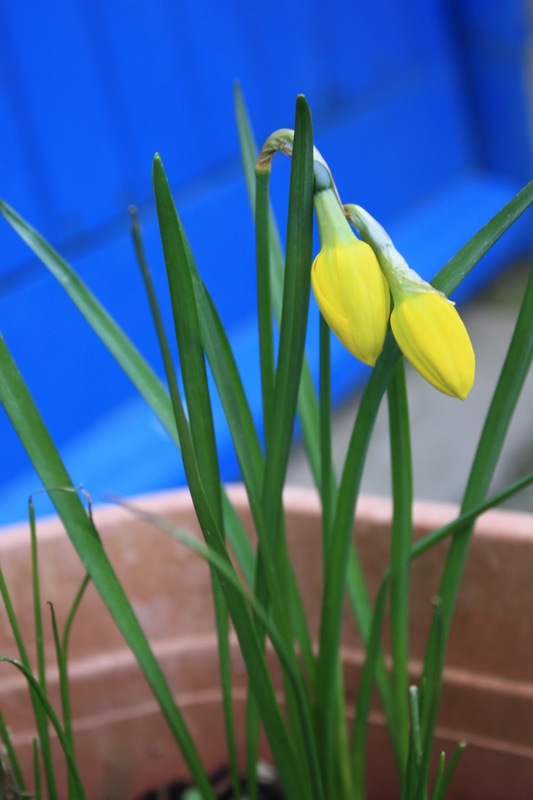 Both workshops are open to all, with donations to the farm always welcome. 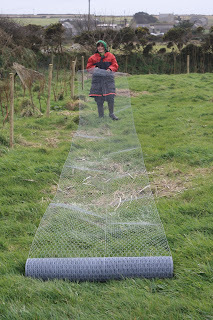 After losing lots of crops to rabbits last year (most of our swedes, most of our 10,000 leeks, over 1000 cabbages, all our carrots and all our parsnips) we have spent the past week constructing a new permanent rabbit-fence around the market garden field (and we'll be growing this years main crops inside last years chicken fence). 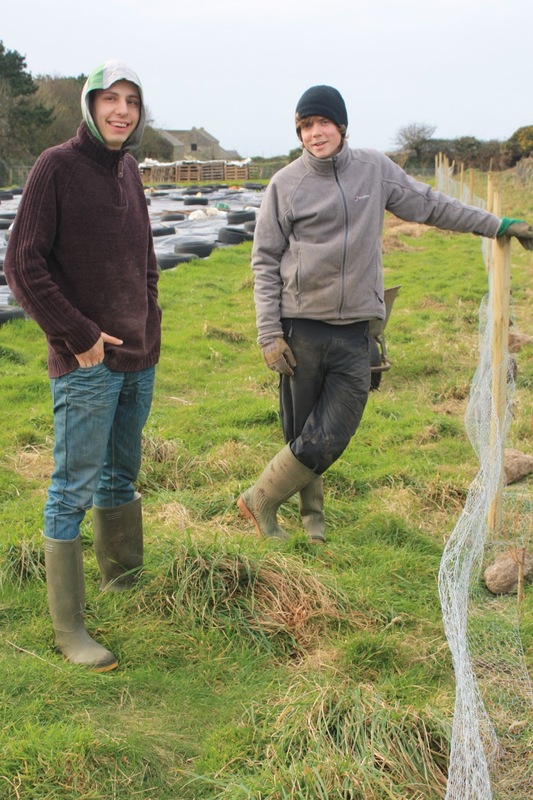 Jonathan and Lloyd enjoy a small break from fencing. We knocked 80 half-round posts in using a sledge hammer and spirit-level, 4 metres apart, added some support posts on the corners and gate-posts, then tacked 320 metres of chicken-mesh around the field's circumference. 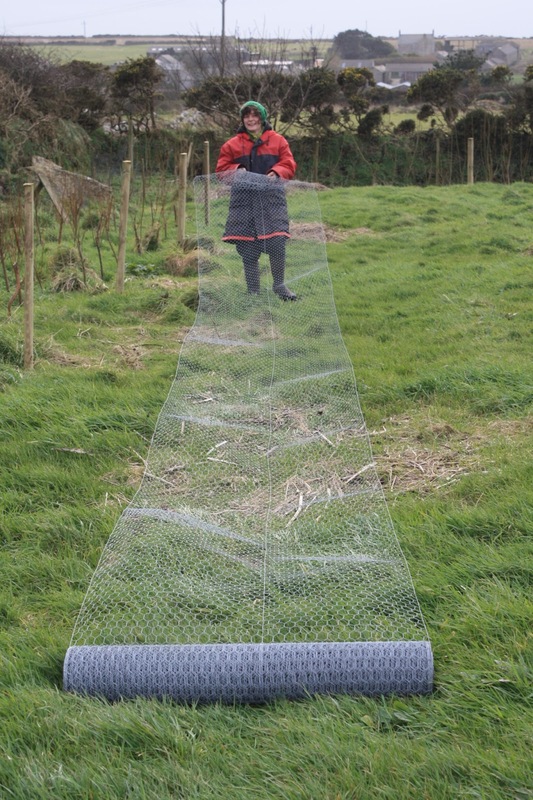 The mesh is laid 10 to 15cm across the ground, then tacked up the posts, the overlap across the ground being to prevent rabbits digging under the fence. This is weighed down with stones until the grass grows through to anchor it into place. Sarah unrolling the next section to be stapled up. 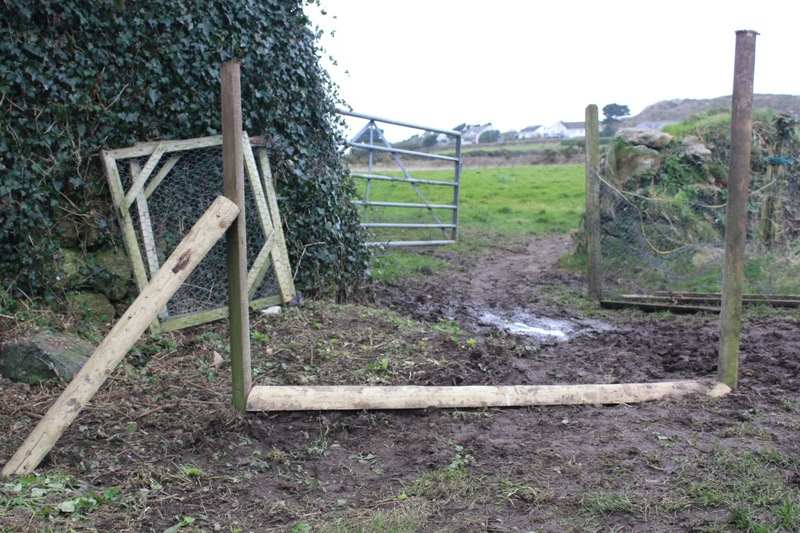 The gates are also now all in place, 2 for tractors and 2 for people/wheelbarrows. 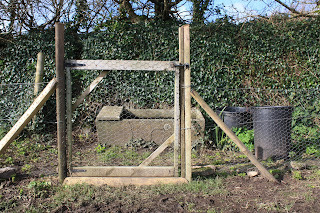 Now all we need is a tension wire around the top of the mesh to stop it sagging, and - touch wood - we defy any rabbit to get in!! Building the new rabbit-proof entrance gateway. As always, a big thanks to everyone who helped on the fence during the 5 days it took to build. Sarah left on Sunday after wwoofing here for one month, so we'd like to thank here for her work and enthusiasm on the farm, and wish her the best in her onward travels. February dates for your diary. Saturday 9th - St Just farmers' market, British Legion, 9:30 am till 12:30 pm. Sunday 10th - singing workshop in The Hive, 4 till 5:30 pm. 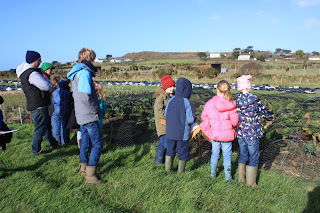 Friday 15th - St Just Primary School "Local Producers' Market", 2 till 4 pm, where the farm will have a stall. Saturday 16th - Pendeen farmers' market, in The Centre, 10 am till 1 pm. Sunday 17th - yoga workshop in The Hive, 4 till 5:30 pm. Monday 18th - steering group meeting in The Hive, 6 till 7 pm. Saturday 23rd - tool care workshop on the farm, with Greg Humphries, 10 am till noon. Saturday 23rd - St Just farmers' market, British Legion, 9:30 am till 12:30 pm. Sunday 24th - singing workshop in The Hive, 4 till 5:30 pm. By this morning our maincrop field had just about dried out sufficiently to allow a tractor to drag a potato-lifter through the soil, and we knew we had a 4-hour window of weather before the afternoon's projected rainstorm began. This is a job we began last November, and have had to give up on twice due to torrential rain and waterlogging. The final four rows of Ambo potatoes had been in the ground waiting for two months since the last attempt, but we got them all out today, due to a superb effort by ten volunteers - so many many thanks to them, especially to those who stayed right to the end and got wet in the process (the rain came an hour early!). 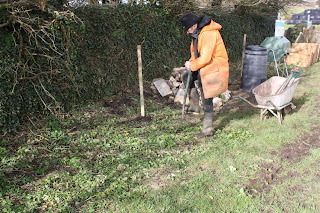 That's a weight off our minds, and we can push on with fencing the field ready for moving our chickens and pigs into it. Jim surveying the site for the new pond. 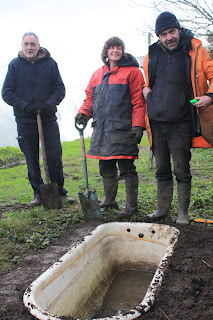 Sarah, Jim and Danny digging the hole. 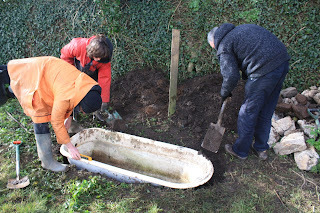 Jim, Sarah and Danny levelling the bath-tub and filling around the edges. Job well done - Danny, Sarah and Jim. 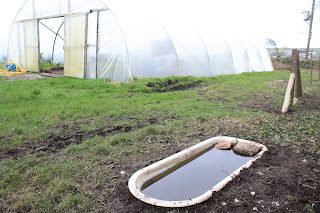 On Tuesday's volunteer session (weekly 1-5pm) we installed a pond next to our polytunnels, to attract wildlife, particularly slug-eating frogs and toads. This old cast-iron bath-tub was once used as a cattle-trough in the farm's cattle-shed, but we thought it would make a fine pond. Later in the day we blocked up the old tap and overflow holes using bungs made from our own willow, made a staircase at the deep-end from stones to allow wildlife to access the pond, and filled it full of rainwater. 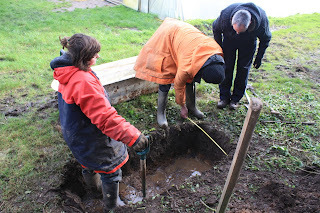 Now we are going to import some frog-spawn from a local pond, and add a fence for safety. Many thanks to Danny, Jim and Sarah for helping with the project. The pond filled with water and rocks, with ploytunnels behind. 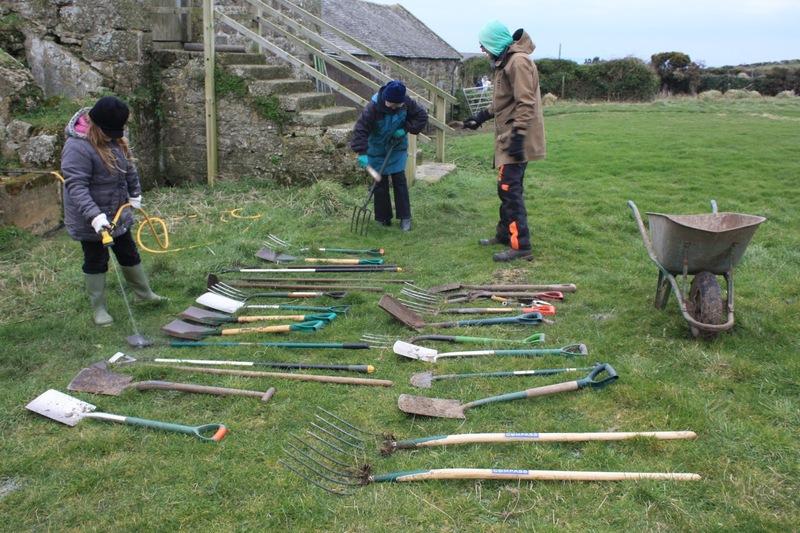 Kevin and Janet have been attending volunteering sessions on the farm since last October, but are now returning to West Australia after a 6-month house-swap in Sennen. They are in the foreground of the broad-bean sowing photo from last autumn. Many thanks to Kevin and Janet for their work on the farm, and for keeping coming back for more - volunteer input like theirs is invaluable, and one of the main reasons for our existence as a community farm. Bon voyage! Evelin, from Salzburg, has also just left us after 3 weeks wwoofing on the community farm - she has gone to another farm in France for 6 weeks. Many thanks to Evelin for her help and hard work, and for her veterinary advice, and for helping with the school group last Wednesday. Bex, who wwoofed with us for 6 weeks this time last year, came back for another week and has left again (but wanted to stay longer...). Thanks go to Bex for returning for more hard work on the farm and in the kitchen, and for helping with the school visit last Wednesday. 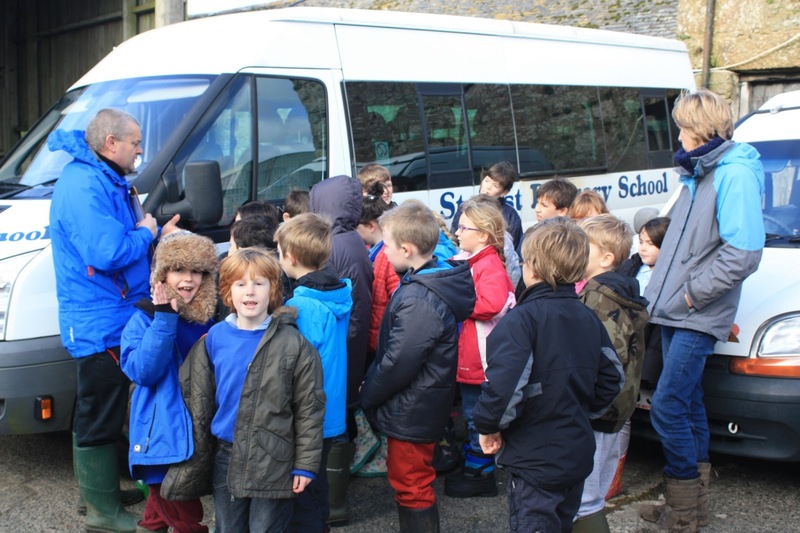 On Wednesday 30th January, three minibuses of pupils came down to the farm from St Just Primary School. 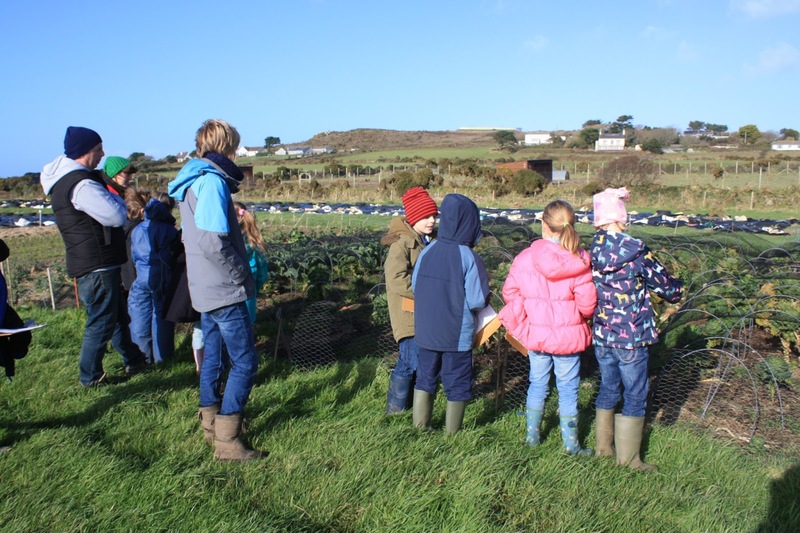 They visited as part of their Enterprise Week, but their visit also tied in with work they have been doing on healthy living, healthy eating, and food miles. 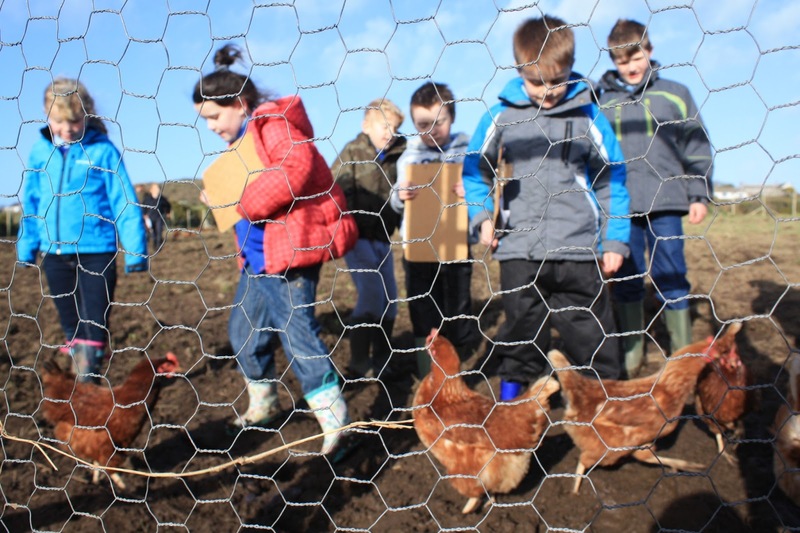 They split into three groups to cover three areas of the farm - chickens and pigs, polytunnels, and outdoor crops. Arriving in the farm yard. ....How many hen houses can you see? ....What happens to the eggs? Guided tour of the market garde field. ....Where will you be able to get a vegetable box from? ....What happens to the plants when they are harvested? ....List two ways in which locally produced food is better. ....What does a business try to do? Thanks to the volunteers who helped show the school around on the day, and for answering all those questions. 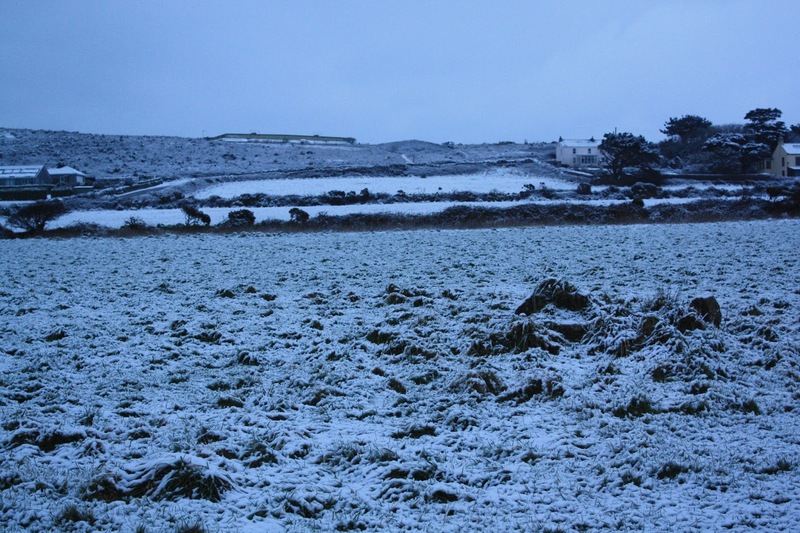 For the third year running the "unusual" happened and we had either snow or hard frost here in West Penwith. This time the snow was thin and disappeared within a few hours, and I just had time for a few quick photos before catching a train to the Organic Producers' Conference in Birmingham. 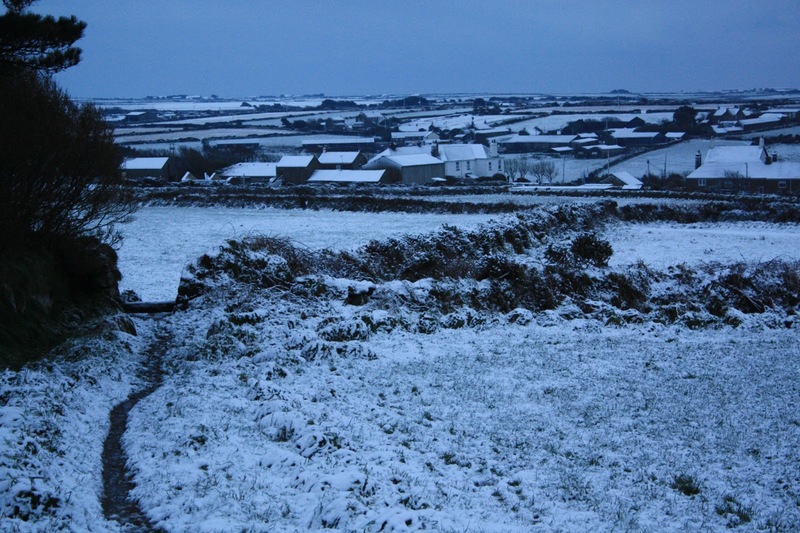 Fields of the farm, looking towards Carn Bosavern. 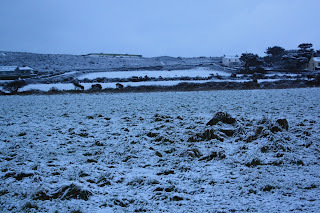 The farm buildings seen from the path into St Just.